I couldn't resist painting this cute little lamb. It was interesting painting the woolly coat - I found it a bit different to painting fur. 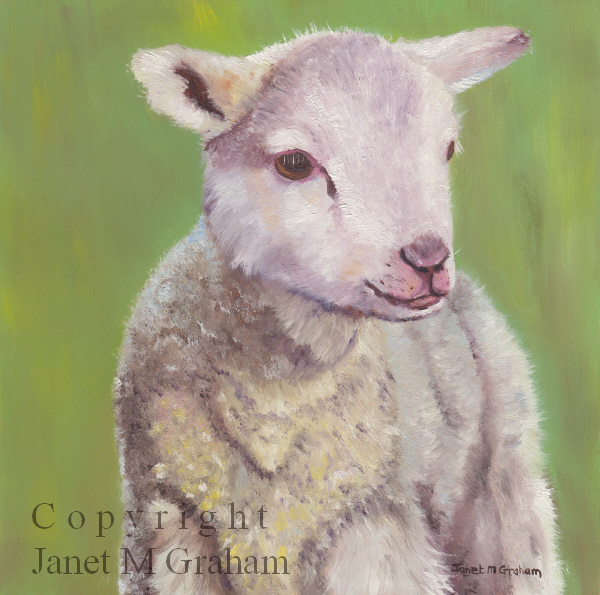 Spring Lamb measures 6 x 6 inches and is painted on Ampersand gessobord. I couldn't resist painting this little bird when I saw the reference photo. I love the angle of the birds head and how the light falls onto the feathers. 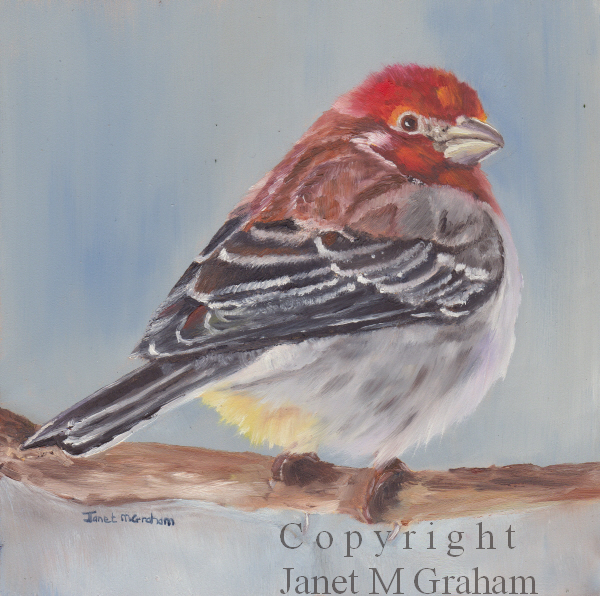 House Finch measures 6 x 6 inches and is painting on Ampersand Gessobord. This one was rather a challenge to paint. I used a rigger brush to paint the eyes - they are so small. The snail was also painted with a rigger. 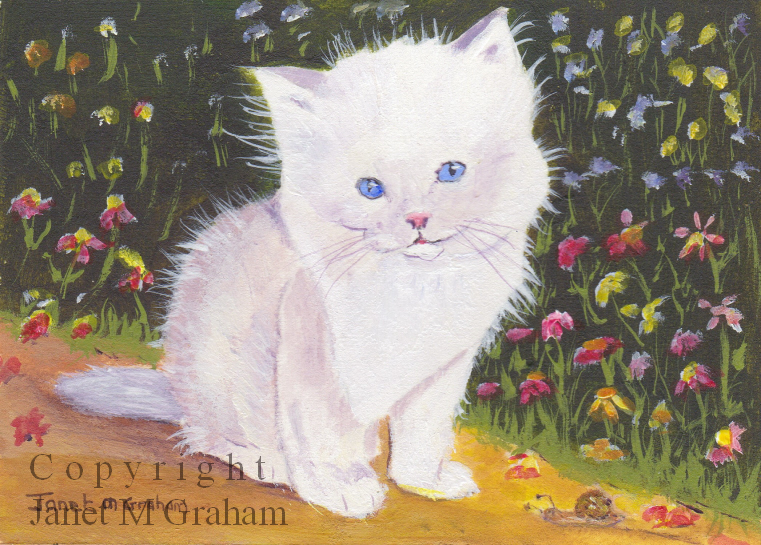 I really enjoyed painting this little kitten so I will have to paint some more animal ACEO's. Kitten measures 3.5 x 2.5 inches and is painted on 300gsm Arches Smooth Watercolour paper. I bought mushrooms the other night for dinner and thought to myself that a mushroom would actually make rather a good still life subject. Was interesting painting it as it is not just white. I will have to paint some more mushrooms but feature them in a larger painting. 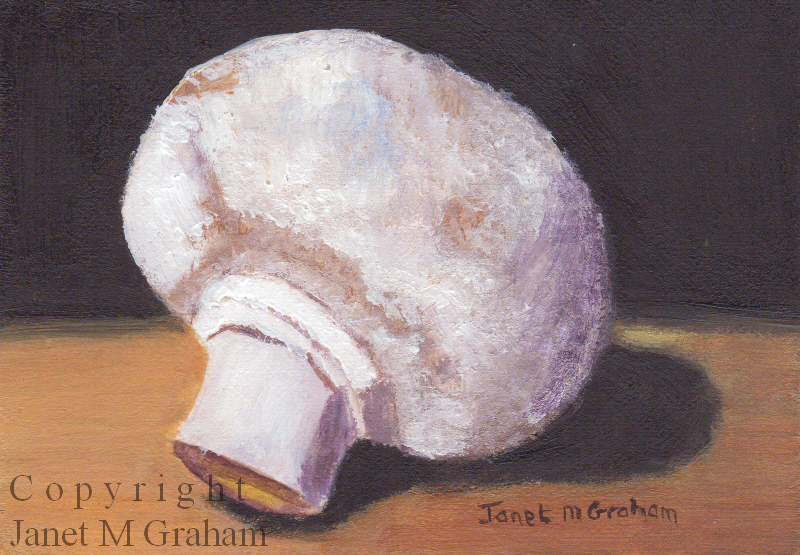 Mushroom ACEO measueres 3.5 inches x 2.5 inches and is painted on Arches 300gsm smooth watercolour paper. Enjoyed painting this one. Painting the egg was interesting as I had to think about what colours to mix together to get the right colour for the shell. I also loved painting the egg cup and tea cup. 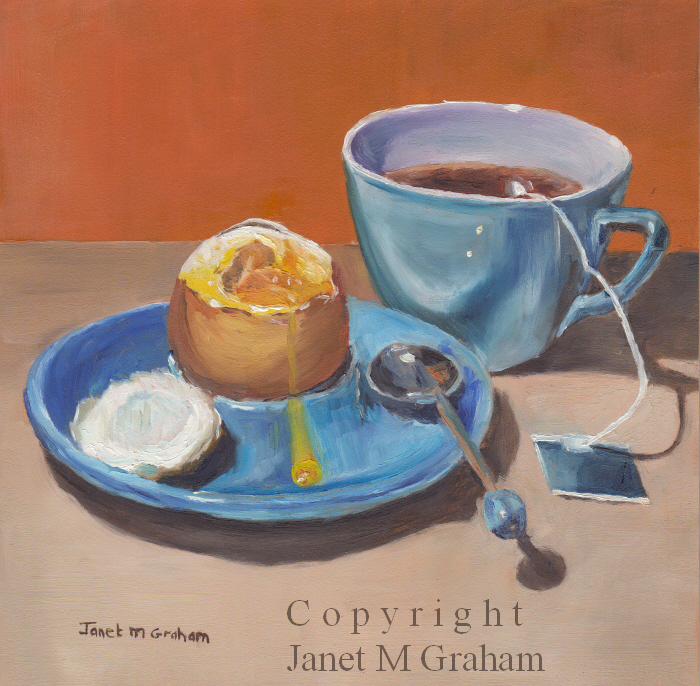 Breakfast measures 6 x 6 inches and is painting on Ampersand Gessobord. This was one of the views of the Bed and Breakfast that I stayed at when on holiday in Tasmania in 2007. It was the old railway station (built in 1838) that was used to offload supplies before they were transported to the prison site at Port Arthur. Hence the name of the B&B is Norfolk Bay Convict Station (http://www.convictstation.com). The Port Arthur Historic site was only a 10 minute drive away. (http://www.portarthur.org.au). I love visiting Tasmania - there is so much to see and do at different times of the year. 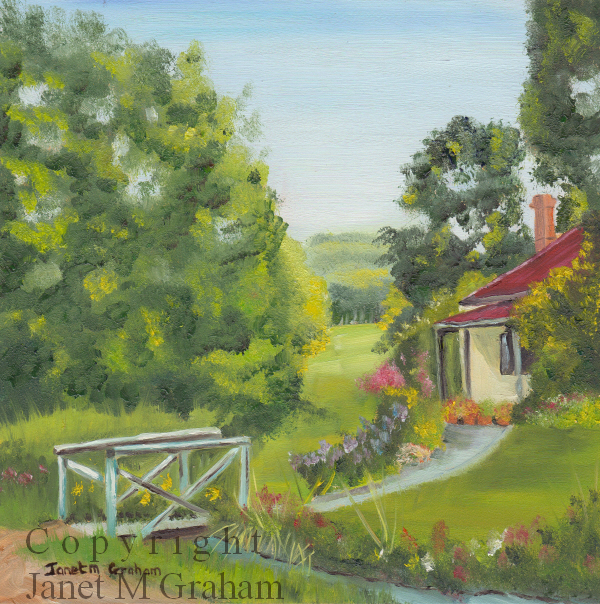 Country Cottage measures 6 x 6 inches and is painted on Ampersand Gessobord. 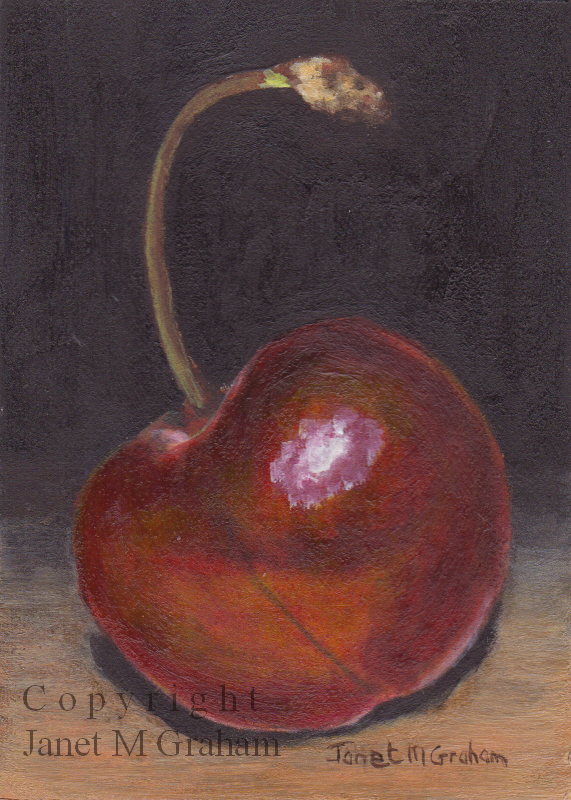 I enjoy painting this Cherry ACEO. The only problem I had painting it was that I had to use acrylic paints and it was very hot yesterday so the paints were drying out rather quickly. I eventually put the air conditioner on which help a bit. Fortunately it has cooled down again today. Cherry ACEO is painted on 300gsm Arches Smooth Watercolour paper and measures 2.5 x 3.5 inches (6.4 x 8.9 cm). I visited Oatlands, Tasmania in 2011 and this is the lane that leads to the Callington mill (https://callingtonmill.com.au). The restoration of the mill was completed in 2010 and it is a working mill . You can buy flour that has been grind in the mill. The bakery also uses the flour grind in the mill to make bread etc so it was rather nice to have lunch at the bakery knowing that the bread was made from the flour grind at the mill. 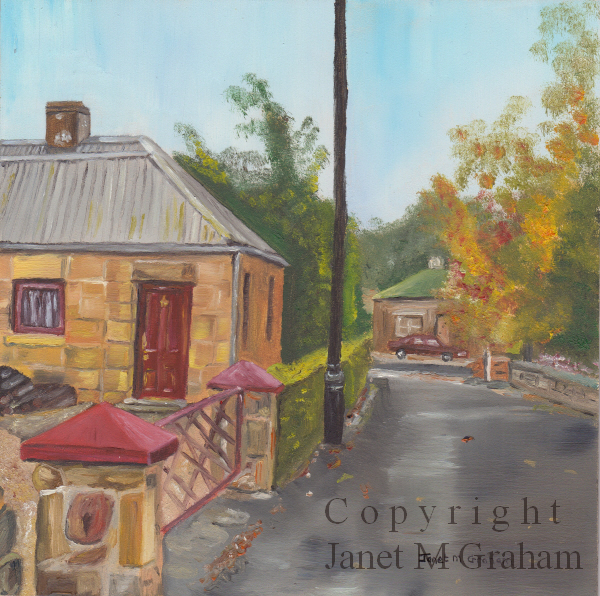 Oatlands is a lovely little town with so many of the beautiful old sandstone building still standing. Country Lane measures 6 x 6 inches and is painting in Ampersand Gessobord. 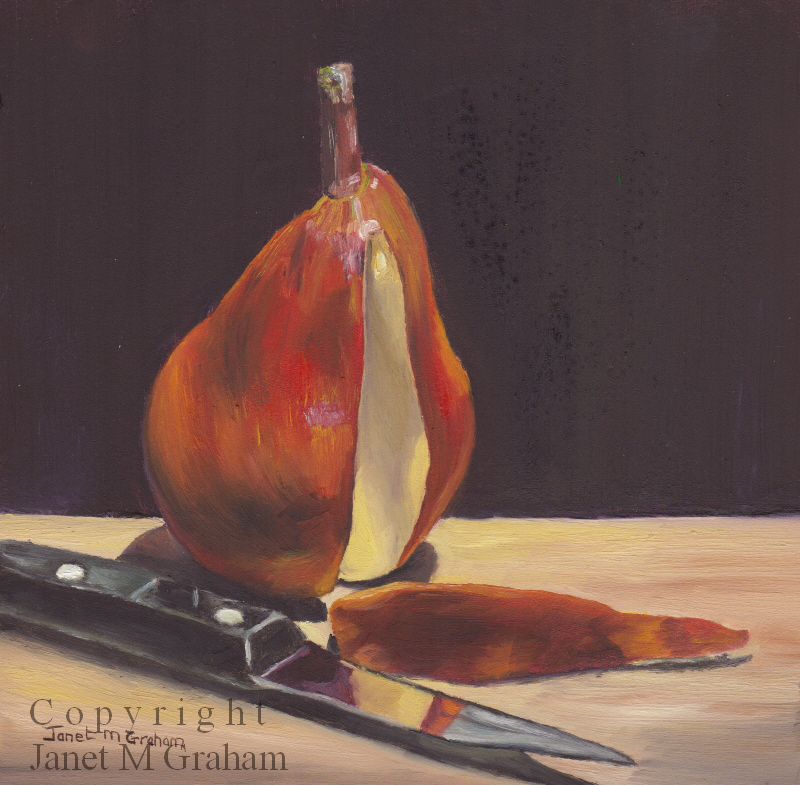 Decided to do another painting of the gala apple as I love the fact that it still has it's leaf attached. Was interesting painting a green leaf against a green background - amazing how many variations of greens that can be mixed. 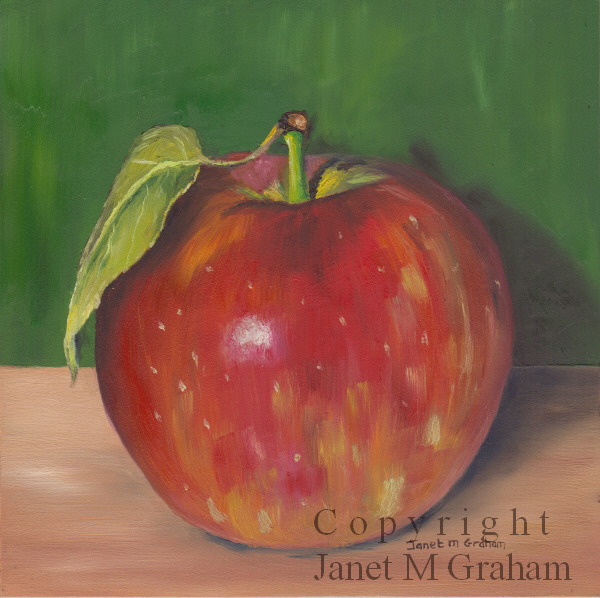 Gala Apple 2 measures 6 x 6 inches and is painting on Ampersand Gessobord. I love the vibrant colours of the water reflections in this one. Was fun painting the swans too. Got me thinking that I must go and take some photos of the black swans that live on the lake just down the road from me. Just need the weather to settle down a bit - would be nice to have a few days of just sunshine but so far this month it has been partly cloudy with showers. 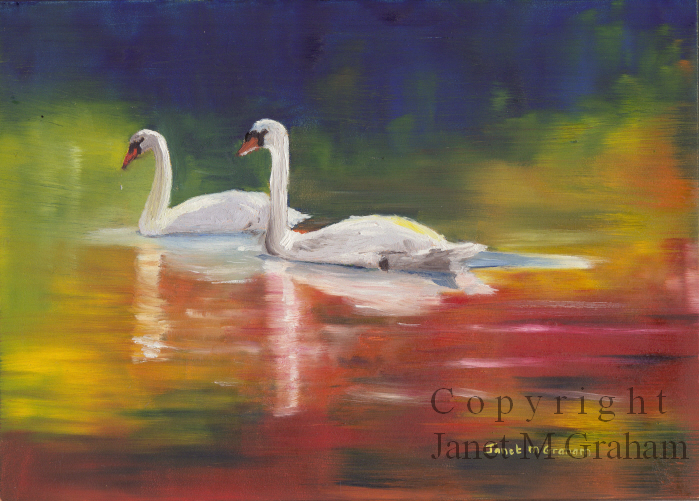 Swans measures 7 x 5 inches and is painted on Ampersand Gessobord. Many thanks to Jane Best for the reference photo. I am really happy with this one. 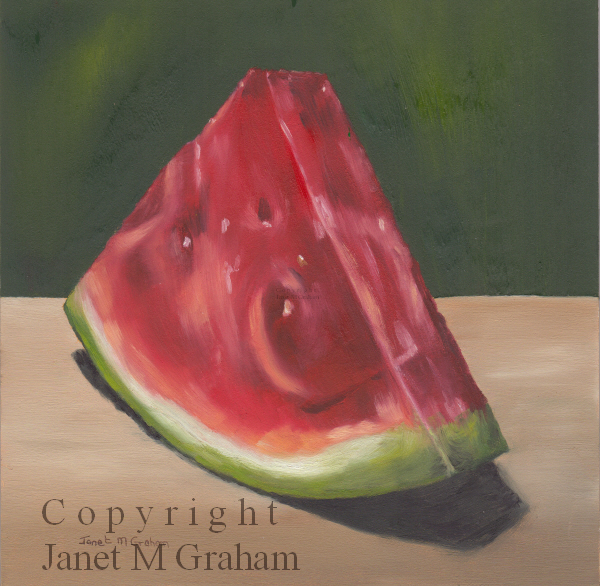 I decided to paint the watermelon at an angle and I love the 3d effective that I created. Watermelon Slice measures 6 x 6 inches and is painted on Ampersand Gessbord. I was in the fruit shop the other day and as I was standing in the queue to pay I noticed a display of gala apples. I don't normally buy gala apples (I prefer Pink Lady's) but this particular apple caught my eye as it still had a leaf attached to it. So of cause I had to buy it so that I could paint it. 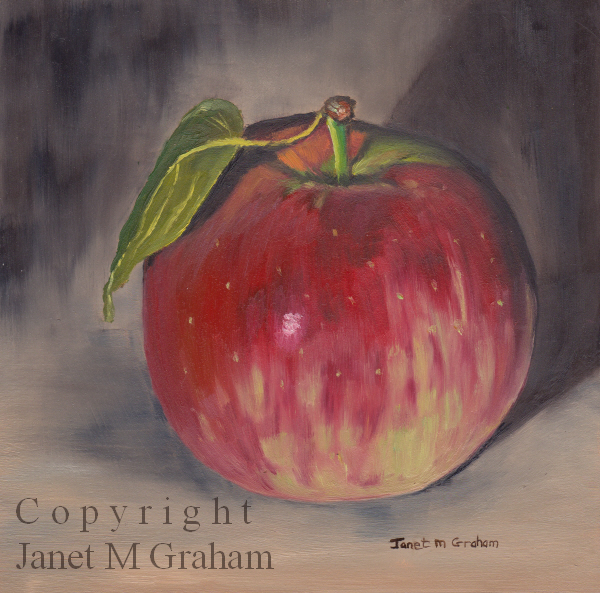 Gala Apple 1 measures 6 x 6 inches and is painted on Ampersand gessobord. I am really happy how this one turned out. It took me a while to find the right position for the pear slice but it worked out well in the end. Snack Time measures 6 x 6 inches and is painted on Ampersand Gessobord.